How did the discovery of DNA prove that Darwin’s theory of evolution was correct and how does it change the way we view evolution today and into the future? Including 3 specific examples from the video. When Darwin found the differences in the Finches beaks, he theorized that a species will change to be best adapted to it’s environment. This theory is supported by DNA. When a species is not well adapted, it will be eaten and die out quicker than a species that is well adapted. The better adapted species will survive longer, thus passing on the gene mutation that creates the adaptation to better survive. Darwin had theorized this natural selection process, before DNA analysis had proved it. This discovery allows us to find out how species evolved over the years and help find connections to past organisms. The evolution between apes and humans is another example of Darwin’s prowess in the field before DNA confirmed it. DNA has revealed that humans and apes are closely related as 99% of the DNA between the two species is similar. Darwin theorized that humans had evolved from apes, as was consequently belittled and bullied for this theory, which we now know is correct. There are certain gene mutations that have occurred over the years of life on earth, that formed humans from apes, or at least had them related. The DNA that allowed humans to have a large brain is an example of a gene mutation that occurred in apes that allowed the development in humans. The discovery of this relation to another one of earth’s creatures through DNA has changed the way we view humanity and our role in nature, it also changes how we see other animals and the relations between species. 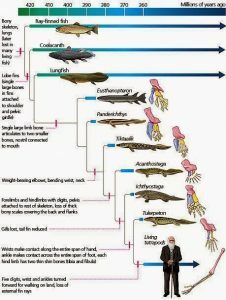 When DNA found that paddle fish had similar DNA to an ancient fish that developed arms, we knew that there are living ancestors of ancient creatures that went extinct long ago. When paddle fish had been found to be in a more primitive form, this allowed scientists to see another example of gene mutations and survival of the fittest. 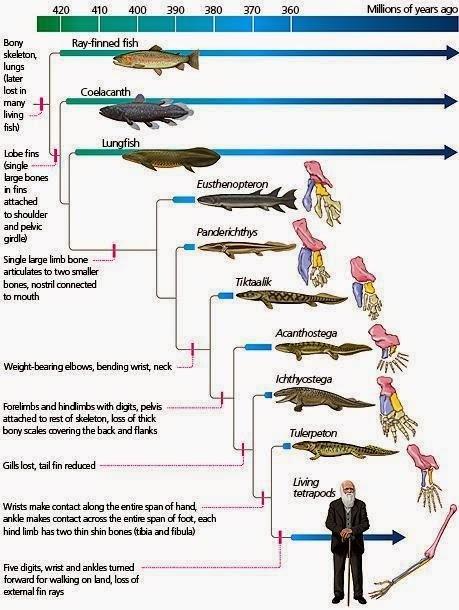 The ancient fish had developed a gene mutation that allowed it to grow arms to flee from predators, thus leading to its evolution into all sorts of land creatures, depending on the location on land which it inhabited. The DNA evidence of this phenomena further proves Darwin’s theory of evolution, and allowed scientists to further DNA research and unlock the mysteries of DNA.